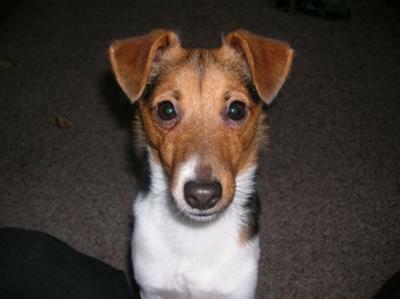 Every month our readers enter their favorite Jack Russell Pics for our monthly contest. Enjoy these entries in our December 2011 contest. Be sure to entire your Jack here for our monthly contest here which will be selected on January 6th. If you don't want to miss the announcement, subscribe to our Jack Russell newsletter using the form on the right. Also, be sure to vote on the next Jack of the month using the poll widget on the right to vote). 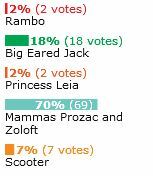 And the winner is.....Mamma's Prozc and Zoloft, our December winner by a wide margin. See all the entrants below and in our world, every Jack is a winner. Now everyone can vote on their favorite Jack Russell Pics every month. Many readers asked for voting instead of the our editors picking our favorite. Please review these entries and pick your favorite. We'll announce the winner on December 6th. Be sure to entire your Jack here for our monthly contest here. Rambo will be 1 yr on Nov 2, 2011. A real challenge for 73 yr old owners. 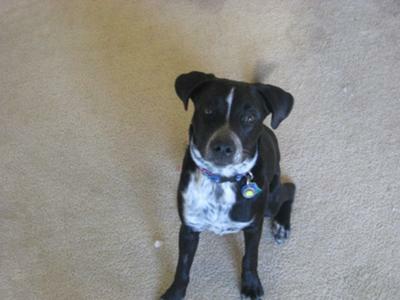 Leia is a russell terrier/curly coated retriever mix with some border collie in there. She has soooo much energy and is very talented. Even though she's still a pup (6 months), she can play catch from across the room, jump probably over us, and when we tell her to give us a kiss she does! We are so lucky to have her, and she's lucky to have us with all the spoiling we do to her haha. So home we went, He was promptly named mamas Prozac! He was the sweetest, most cuddly boy I had ever seen. I always believed one should not be an only child, so I began surfing the web. I discovered Zac was a Jack Russell Terrier. as I had never had one before. 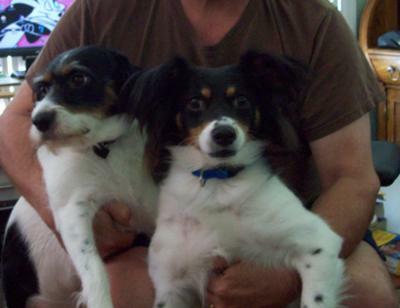 I was unsure, so I visited Jack Russell rescue sites and looked through thousands of pics. finally seeing one that spoke to me through her eyes from 100 miles away! I adopted her without meeting her prior, and she was delivered to me a week later by the rescue. Scooter is a Jack Russell Terrier that will be 7 years old in November. He is a very funny dog and a joy to have around. 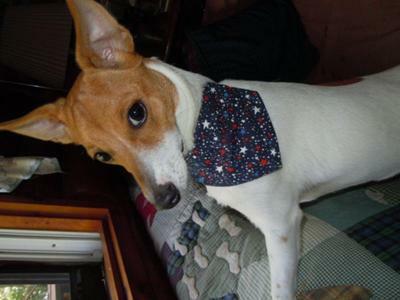 Though he has his "Jack Russellisms" he is well trained, well behaved most of the time and loves everyone and other dogs. Cat's not so much. He knows his toys by name.....can tell when you are laughing at him and doesn't run when you "pretend" to throw the ball, because he knows you didn't throw it. He loves to chase squirrels and never seems to learn his lesson with skunks. He's such a good little dog even at the vet. I am a vet-tech and I'm very proud of him when he comes in for his annual visit. He also smiles when he's happy. People think he's growling till they realize he's smiling at them. 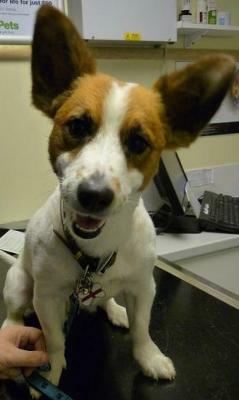 He is a very special little dog, but I knew what to expect when getting a Jack Russell Terrier. Good luck to the person who doesn't do their homework and thinks they're getting "Just another dog". Actually it's sad because those are the dogs that end up at shelters. Their owners just didn't know what they were getting into. 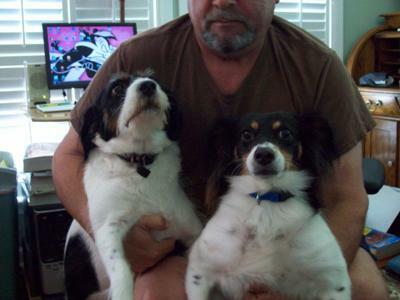 Vote for your favorite Jack Russell Pics using the widget on the right. Go to the Jack of the Month main page to view the latest entries.